How much have you changed your internal approach to reflect these changes? I recently co-facilitated a “Retail Leaders’ Forum” for retail executives responsible for category management, with Tom McDonald of the Category Management Association. We talked about the importance for this audience to evaluate their current catman approach in 3 areas. Your team’s purposes are “contracts” with the outside world by providing clarity on what your team is focused on. Purpose is a pre-condition for effective work design and output. While you may expect that your team should know your purpose, it’s always best to formalize it, adjust it as your business evolves, and communicate it throughout your organization so everyone understands it. Outputs refer to the outcomes that result from being a category management organization. According to CatMan 2.0™, there are 2 key outputs in retail category management. The Category Platform, which summarizes the organization’s best thinking on how to “go-to-market” in a category, including the steps of category management, and the 8 steps of the category management process, customized for each retailer based on what’s most important in their business. The Category Plan, which is the application of the Category Platform through retailer category plans. The ultimate output of the category plan applies the thinking, strategic and action from the category platform to focus on what’s required to achieve category objectives. Once you’ve established your purpose and outputs for your CatMan team, you need to look at inputs – or the raw materials – required to effectively get category management work done. DATA, including a robust data set such as scanned sales, market, consumer panel, loyalty and Shopper insights data. And, just having a lot of data isn’t enough – you need to integrate the data as much as possible, and provide an analytic pathway and Shopper insights library for your organization to increase an aligned way to approach category and business reviews. TOOLS, that are easy to access by your CatMan team and include all key data sources to help them make more strategic, fact-based decisions. You have to ask — How effective are your tools and what’s missing? How well do you incorporate existing tools into your standardized process? Would you rather have your team spending 80% of their time gathering the data or drawing insights and making better decisions for their categories? I recently ran a live training session for a retail client on promotional analysis. The team loved the training, but identified their biggest barriers to this more strategic approach to promotion as a lack of overall promotional strategy and the difficulty to access the data from their desks. Creating Centers of Excellence where your catman folks can go for the “heavy lifting” work and perspectives. Developing PEOPLE takes more than DATA and TECHNOLOGY training. Today’s teams tend to be very linear in their thinking, and as the complexity of data, tools, Shopper and omni-channel increase, they need to move to a more critical thinking approach. When I talk about developing the skills of your team, it needs to go beyond data and technology training. It means training your team in the knowledge and practice of category management. If you only focus on data and technology, you’ll get a narrow, tactical work output. But, if you build skills in areas like shopper insights, data to insights, tactics, critical thinking, strategy, product supply, effective deployment, you can go way beyond tactical. Going beyond DATA and TECHNOLOGY begins with increasing internal alignment in your organization. You may have teams that work together on projects, but there are usually silos on different teams that can have different perspectives, processes and even visions for the company. 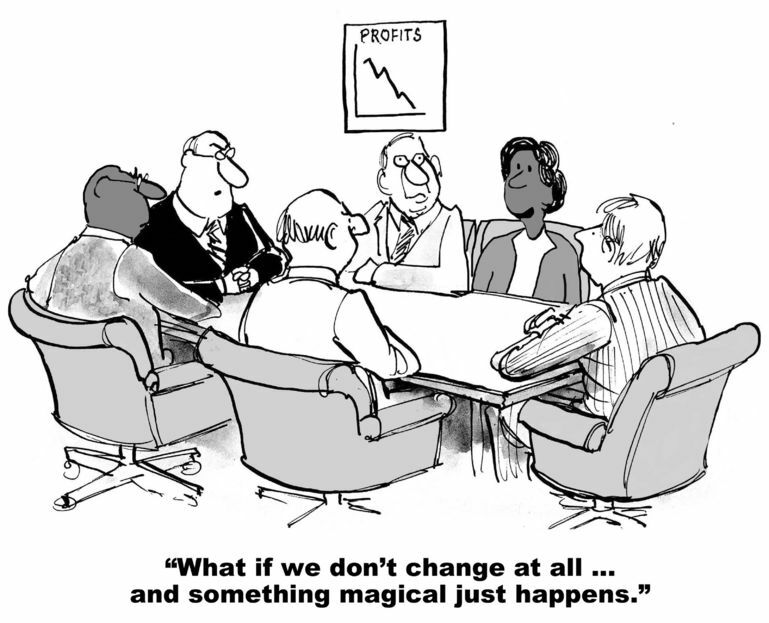 Want to really manage change? Develop structure across teams through aligned strategies, principles and processes and develop broader internal alignment, increase efficiencies, create consistent messaging and focus on Shopper-focused approaches. Having multi-functional teams working more effectively together to achieve organizational goals IS managing change. Category Management training and resulting alignment can help to bring this common approach together for retail organizations. How aligned is your internal team and where are the opportunities? How well-defined is my retail strategy? How well articulated, documented, and shared is our strategy? You need a well-defined retail strategy – including the purpose I talked about in #1 above – with overarching strategies for the department. PRO TIP: Document and share internal catman strategies across your organization, including perspective on banner strategies, category management process, roles & strategies, store clusters, data availability & sharing, JBP / collaborative business planning. Your CatMan teams needs well-defined processes and guidelines to tie together the data, tools, people and strategies for the category management department. PRO TIP: Your team should be trained on the processes and guidelines, with expectations that they will be followed. These enhance and solidify alignment and efficiencies and ensure that everyone maximizes the data and tools invested in to help achieve overall goals for the department. Retail strategy is an area that I regularly get feedback from students on – they work for a retailer that doesn’t have well articulated strategies, making their job much more difficult, and resulting in lack of alignment across desks (because they are left making decisions based on what they know or think). During our Leaders’ Forum, we discussed each of the inputs and gave leaders the opportunity to evaluate their current approach through a scorecard that they filled out during the webinar. The intent was to create awareness of some of the biggest changes in category management, and help participants to identify where their biggest areas of opportunity for improvement are for their retail organization. Remember, the most important thing for you, as an executive leader, to do is “something” (vs nothing). The world is changing and we need to be changing our approaches internally to arm the CatMan team with what they need to efficiently make Shopper-focused, fact-based decisions that align with the overall target Shoppers for the retailer. Want to see what you missed? Request the recording of the Retail Leaders’ Forum, including a Retailer Performance Scorecard download.